Measures about 10 1/2" X 15" X 4 1/4". Profusely illustrated with Woodcuts measuring about 4 1/2" X 6" each. 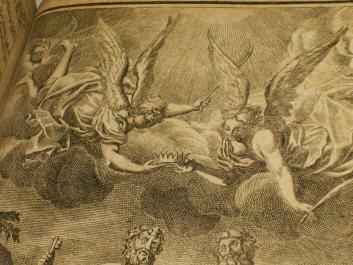 There are Woodcuts throughout the volume depicting various Biblical scenes. There is browning in various areas with some fraying of leaf edges(and soiling) at the front of the Bible though fairly minor. 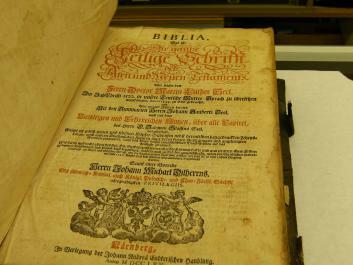 The bulk of the Bible remains in overall good condition. 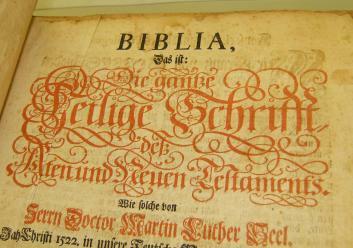 General title printed in red and black with a further engraved title and an engraved NT title. A large page Woodcut with an Angel at the front. 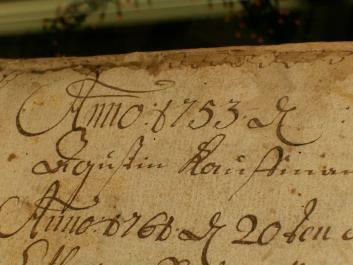 This contains the Old and New Testaments appear complete.. 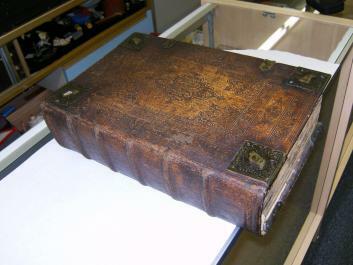 The binding is original with wooden boards, covered with tooled leather.. Remanants of the original clasps are in place with clasps long ago lost. An elaborate designed appears on the metal corners which are laid upon the cover to protect the Bible when open.